*This article originally ran in the Summer 2017 issue of Northern Woodlands magazine and is reprinted here with the permission of Northern Woodlands. Many thanks to the author Ben Emory. 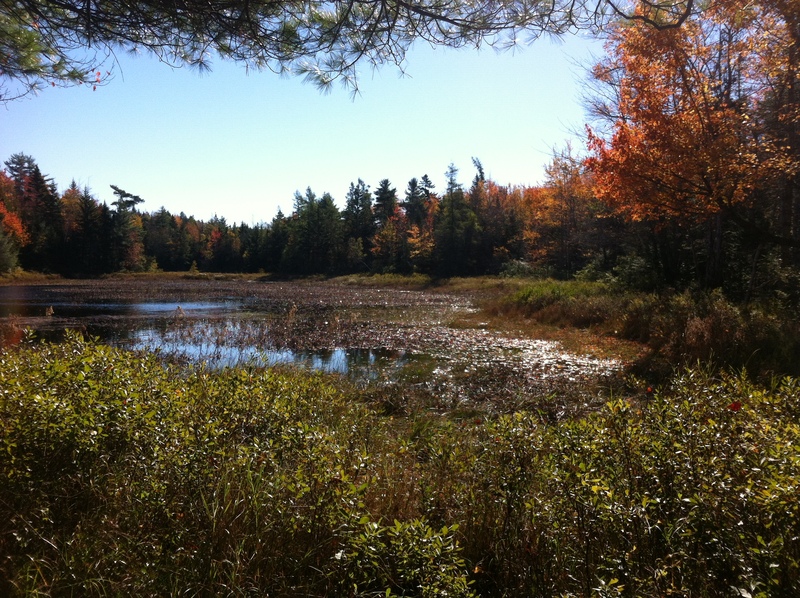 Many conservation projects in the Northeast are trying to conserve natural land linkages between critical ecosystems and habitats. 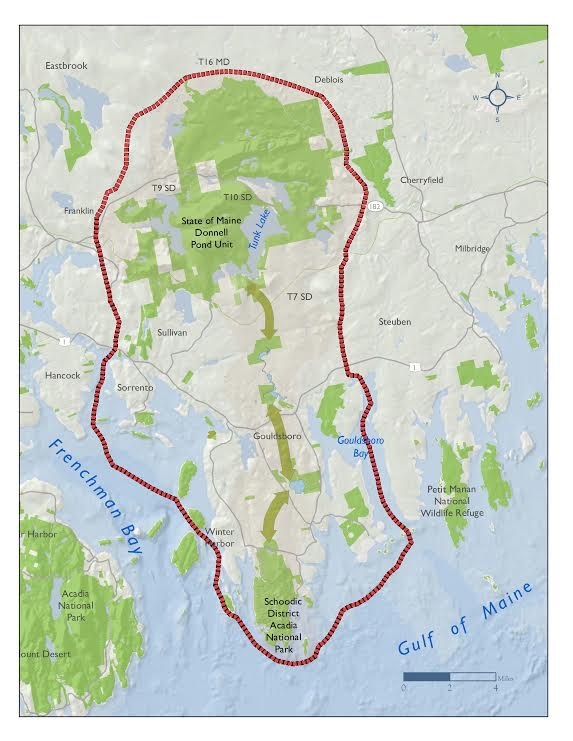 The Schoodic to Schoodic project (S2S) seeks to preserve an ecological corridor running north from Acadia National Park’s famed Schoodic Point to the 15,000-acre Donnell Pond Unit of Maine’s Public Reserved Lands, which includes Schoodic Mountain. The vision of Schoodic to Schoodic includes conserving contiguous tracts of forest, associated wetlands, and non-contiguous parcels that can serve as “stepping stones” for mammals, birds, insects, and plant seeds to travel. Corridors can help species that range widely, can minimize the debilitating effects of genetic isolation, and can enhance survival in the face of environmental changes. Corridors with a north-south axis allowing poleward movement seem especially significant in species’ adaptation to a changing climate. The S2S corridor is doubly important, for it not only leads north toward higher latitudes but also provides a path southward toward the coast, which the ocean keeps cooler than the interior in summer. While benefiting flora and fauna, the S2S corridor offers many opportunities for the public to enjoy a wide variety of outdoor recreations. The conservation of this corridor began in the late 1920s when private landowners donated Schoodic Point and it was added to Acadia National Park. 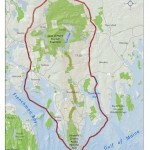 Today, Acadia’s Schoodic District comprises 3,500 acres and forms the end of the massive peninsula south of Route 1. The brutal Atlantic Ocean frequently crashes spectacularly against the great sloping rocks at the tip. 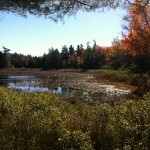 Decisions about the final disposition of the northern half – arguably the most important part ecologically because of its extensive freshwater wetlands – are ongoing. The anonymous owners have already given permission for the Schoodic Institute at Acadia National Park to establish forest monitoring plots as part of a plan for such study sites from Schoodic Point to Schoodic Mountain. The Institute’s forest ecology program director, Dr. Nicholas Fisichelli, explained that, “This area has a strong climate gradient driven by the maritime influence and thus provides a tremendous opportunity to study forest dynamics and change across the local landscape.” This research follows work done by University of Maine forestry students on the Schoodic Point area’s significant jack pine stands. The north-south endpoints of S2S are easy to determine, but the east-west span is open to interpretation. Included in the corridor vision are coastal islands flanking the peninsula, for birds, some mammals, and some plant species easily cross narrow stretches of water. A milestone success in this geography was The Nature Conservancy’s first Maine island purchase, 129-acre Turtle Island, home to a rookery for great blue herons. Subsequently, many more islands east and west of the Schoodic peninsula have been preserved. Turtle Island was bought in 1963 to prevent its being denuded for the St. Regis pulp mill on the lower Penobscot River in Bucksport. Taking wood from Maine islands was still economically viable, although subsequently the economics became prohibitive. Today, that mill and others nearby are gone. A biomass electric generation plant in Jonesboro has also closed, adding to the challenge of profitably managing even mainland working forestlands in the area. So far, markets continue to exist for sawlogs and, with additional trucking costs, lower quality wood at more distant mills. In the S2S corridor, there are private commercial timberlands, large and small – many well managed – which hopefully someday will be protected with working forest conservation easements. Leaving the cove, I struggled across slash left in a clear cut to reach the property’s other side, which fronts on a large marsh, much of which is on abutting property under conservation easement. Not only was this parcel important to wildlife crossing Route 1, but, significantly, it would enlarge a block already conserved and one with promising conservation opportunities to the north linking to the Donnell Pond Unit. If ever a property exemplified the importance of strategic connector parcels in preserving a corridor, this was it. This parcel that Maine Coast Heritage Trust spotted as an opportunity, and on which the conservation fund helped negotiate, was purchased by Frenchman Bay Conservancy 18 months after my visit, fabulously exemplifying the effective partnerships powering S2S. As the author I want to be sure that readers know that this article originally ran in the summer 2017 issue of Northern Woodlands magazine and is reprinted here with the permission of Northern Woodlands. The Northern Woodlands magazine is outstanding on the topics of nature and forestland in the Northeast US. Very much worth subscribing to! Such a wonderful article, thanks for reposting!